When T-shirt weather rolls around, you just gotta have eye-popping arms-you know, the kind of sleeve-stretching size that makes you look as if you have 20-pound hams hanging by your sides. You no doubt already train your biceps till you can’t brush your teeth-yes, soreness can affect hygiene. There’s more, though, to getting gargantuan guns than training bi’s and tri’s. Sometimes a less obvious mass jack can turn molehills into mountains. Take advantage of that, and your arms will grow to immense proportions. What the hell are we talking about? Building your brachialis muscles to crank up your arms’ visual impact-and it takes only a few extra minutes after your biceps routine. The muscle that snakes underneath your biceps and appears as a knotty mass between the bi’s and tri’s is the brachialis. It looks deceptively small, but you see only a small segment of it. The entire muscle is much larger than that, and the bigger you build it, the more it can push the biceps skyward, giving you bigger, thicker arms. You may have heard of it because Arnold was a big proponent of training the brachialis for extra arm mass. If you want your arms to take on new dimensions fast, you gotta build it up. When you plump up and pump up your brachialis muscles, you’ll quickly get more gnarly, jagged peaks to your biceps. 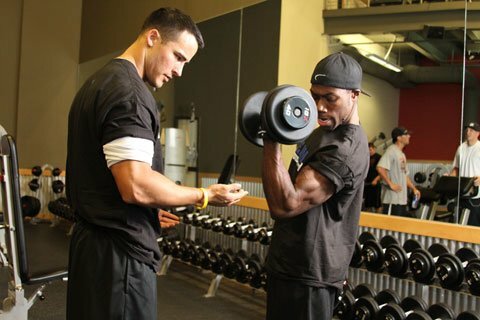 If you train your biceps with four to five sets, as we prescribe in our e-books at X-Rep.com, and follow with a quick brachialis attack, people’s eyes will get as big as silver-dollar pancakes every time you flex. Working A Muscle In Its Stretched Position. 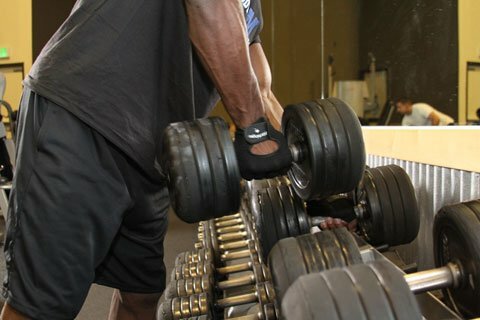 Use dumbbells that enable you to get eight tough reps on incline thumbs-up hammer curls. Keep them moving in a pistonlike fashion-no rest at the top or bottom-a cadence of about 1.5 seconds up and 1.5 seconds down. Remember, no pauses. Keep tension on the brachialis muscles throughout the set, and at nervous system exhaustion, when you can’t do another full rep, do X-Rep pulses from just out of the full stretch position at the bottom, pulling each one up about six inches. Those short blasts extend the tension time and enhance fiber recruitment exponentially. If you can’t pulse, do a static contraction down low. In other words, hold the weight steady-at that max-force point, elbows slightly bent just before the straight-arm position-till you can’t stand the burn. Immediately rack those dumbbells and grab two more that are about 10 pounds lighter. Jump back on the bench and crank out four to six more reps-as many as you can do-no X Reps this time. Immediately rack those dumbbells and grab two more that are another 10 to 15 pounds lighter. This time use the Double-X Overload, a.k.a. DXO, technique-after each full rep, do an X-Rep partial near the bottom of the stroke. If you can’t stand using such light dumbbells or your front delts burn too much on this last phase, you can substitute barbell, dumbbell or cable reverse curls done in DXO style-not as much stretch, but you can still get plenty of continuous tension by reversing the movement at the bottom before fully extending your arms. Take It You Can Switch To A Different Exercise. Your arms will be pumped to immense proportions, especially if you do this sequence right after your biceps program. It drives even more blood to the area, gives you stretch-position overload and intense anaerobic stress on lower reps while still developing the endurance components of the fast-twitch muscle fibers-namely, the mitochondria and capillaries-and it won’t add even five minutes to your gym time. Those three to four extra minutes will be well worth the time and effort. Wait till you see the skin-stretching pump they produce. Try it. Tack this little routine on to your biceps routine, and you’ll be getting wide-eyed looks whenever you head out in a T-shirt. Your arms have more potential for extreme impressiveness than you think. Hit the brachs, and prepare for stares as your guns morph into cannons.